In last post, we talked about different ways to start thinking like an interior designer when creating your new space. We discussed how it is important to invest in high quality furniture that you love instead of trying to fit too much into your space thus cluttering the room. We also went over how to orient your area rug depending on the size of your room and the desired effect. This week, we start by emphasizing the impact a focal point can have in your space. By focusing in on one focal point in a room you can truly make your space shine by allowing that one element to stand out without the rest of the room detracting from it. In the kitchen, your focal point might be a decadent backsplash above your cooktop highlighted by special lighting. 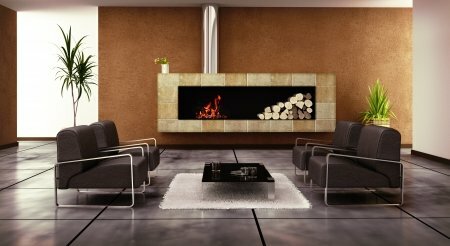 In your living space it could be your fireplace surrounded by a unique tile or large piece of artwork. Whatever it is, if you chose to use a focal point in your room, don’t do it disservice by cluttering the rest of your space with too many design elements. While not true of every individual, many people have collectables that they do not wish to pare down. Instead of filling shelves and end tables with them, these collections can be confined to a specific area (such as a bookshelf or bookcase) or can be displayed on their own in a case. Keep this in mind when designing the room. This could be the focal point of the room or simply a lovely addition, but in order to hold the room together, take the items into account early on. By now you are probably beginning to feel like you are getting the hang of this whole interior design thing! Check back next time for some more tips on how to create your dream space!